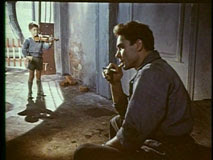 The Steamroller and the Violin is a short-feature film. The story in the film is very simple. The action takes place within one day, the dramatic composition is without sharp conflicts, and therefore non-traditional. 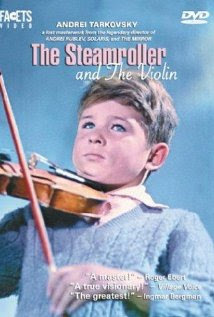 Its main characters are a young worker driving a steamroller at a road construction and a young sensitive boy who is learning to play the violin. They become friends. Those two people, so different in every respect, complement and need one another. Music needs protection and resources to flourish whereas raw human effort longs for music as an ingredient for its emotional fulfillment. The intent of the director is to make a poetic film. The film is basing practically everything on mood, on atmosphere. The entire composition is filled with magnificent images. In Tarkovskiy's first film we already see the seeds of his later rejection of the mere symbol and his fundamental emphasis on the "creative efforts" of the audience. For example, note very carefully his deliberate use of the water element throughout the movie. Tarkovsky, at 28, was striving for his own Truth and his own Language, and The Steamroller and the Violin is very clearly the first baby-steps towards the full realisation of these concepts.